Insert Disk collects DISC for the Commodore Amiga. 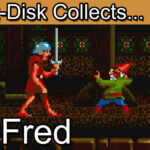 Today’s retro game review is DISC for the Commodore Amiga. This retro gaming classic is a true hidden gem. DISC for the Commodore Amiga, sometimes known as Loriciel’s DISC is a futuristic sci-fi discus throwing game. It shares some similarity to the game Tron: Deadly Discs but goes much further to create a unique experience. Now incredibly valuable in its factory sealed state, DISC for the Commodore Amiga is well worth a second look for serious game collectors. Greetings collectors and welcome to today’s retro game review. As game collectors each of us have our own particular favourites. Whether it’s that super rare edition of a game you finally get to put in your display cabinet or just a game that you thought that you would never see. Today I’d like to share with you a game that I honestly never thought that I would see in my collection. It’s one of those games that eluded my collecting claws for many years. The game is simply called DISC but sometimes referred to as Loriciel’s DISC to help identify it. Whilst the Atari ST version of this game is somewhat common in Europe, its big brother Commodore Amiga counterpart is like a whisper in the darkness. Up until 2016 I had only ever seen emulated or copied versions of this edition of the game. Every collector has a hit list and DISC for the Amiga was very much in my top 25 to track down. Growing up with a Commodore Amiga you’re naturally spoilt for choice when it comes to a range of games. The Amiga excelled with audio and visual artworks such as Shadow of the Beast, could cope with the all out action frenzy of detailed shoot ’em ups such as Aphidya but it could also be a platform for more obscure game styles. Disc is best described as a high stakes game of frisbee. The game involves elements of strategy, skill and by the end absolutely insane reflexes. 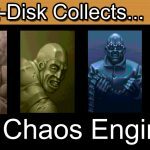 Disc may not be the most complicated, artistic or adventurous game you’ll find on the Amiga. However, right from the start it has the power to pull the gamer in. The loading screen of the players worshiping the Disc along with the dramatic opening music really stays with you. The fanfare is layered with the sound of disc throws and shouts from the players. It’s suitably epic and it really feels like the opening of a tournament. It’s incredibly simple but each element is used to great effect. So, what’s it all about? Disc presents you several modes of play, Practice, Versus, Challenge, Tournament and Championship mode. As you might expect each play out very much the same way, it’s just the opponent structure and competition format that change. Each round you will be placed on a matrix of tiles, each horizontal tile corresponds to the tile on the wall behind you. The Tiles are marked with symbols representing how many hits left they can take before the tile is destroyed. The circle being one, the parallel lines 2 hits, the triangle 3 and so on. The aim is to throw your disc at the opponents’ wall to wear it down. A bit like a human Arkanoid variant. At it’s most basic there are several ways to defeat your opponent. Option 1 is to simply have more energy than your opponent when the timer runs out. This is perhaps the most cynical way to play the game. Each time you hit your opponent they will lose a portion of life, you will also score a point. The second method is perhaps the most dramatic and that’s a win by knock off. If you get trapped by the disc it’s possible to be pushed over the edge to your doom. Method three is perhaps the most common route to victory and that’s a win by either points or total illumination of the tile set. Should you gain total dominance in the round it’s possible to illuminate all of the opponents standing space. It’s a satisfying position to be in. This in itself already makes for a great game. However, there’s a few twists thrown in for good measure. Firstly, the strength of the tiles, generally the further in to the tournament the more hits the tiles can withstand. There will be no quick wins, it will take strategy to wear down key tiles to restrict your opponents’ ability to respond. Secondly is the number of discs, initially you start with the only disc giving you the advantage. Later on though expect to come up against the tough guys. 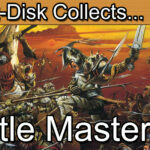 Masters such as Zorg start with 2 discs compared to your single disc, immediately giving them the upper hand. Periodically the court also spawns a spinning shield player making the game more unpredictable. On top of this the most useful feature will undoubtedly be the power up tiles. From time to time expect a special tile to appear giving an advantage to the player that can hit it first. Specials include a speed disc, power disc and a master disc. Master discs have the ability to destroy invincible tiles whilst the power and speed discs behave very much as you would expect. Once you’ve got your head around the rules Disc becomes a real treat for the brain and reflexes. Although the throwing and attack aspect of the game is the most prominent the defence strategy shouldn’t be ignored. Each player is armed with a light shield to deflect the incoming discs. Should you defend against the disc it will change to you players disc colour and be in you control. Only when a disc is controlled by you can you safely catch it. The dynamics of offence and defence mixed with the variables and power ups make disc an incredibly deep game to play once you are in the zone. Although some of the controls have been described as a little awkward I’d say that there’s some incredible finesse that the developers were able to include in there too. For example, you can run, slide and bounce your disc off the wall at speed. This can be incredibly difficult to defend against. The game really comes in to its own when you start picking up speed and trying to form a strategy to take out those key tiles from your opponent. Trust me on this one, once you get over the initial learning curve you’ll be back for more time and time again. It’s at this point I’d usually tell you about the physical release of the game. This week though I’ll only be able to show you the outside the box. Originally I’d planned this episode as a rarities special but didn’t want to hold off any longer. What you are seeing here is a mint boxed and shrink wrapped factory edition of Disc for the Amiga. Although I’m a collector of games I very rarely buy a game to speculate on price increase or just to fill a shelf to say I have it in the collection. Quite frankly it’s not a great use of well-earned cash in my opinion. I’d much rather be buying games that I can play and enjoy. As I mentioned earlier I had put off this episode as I’ve been in a dilemma. It’s not every day you get a factory sealed game that’s also incredibly rare. 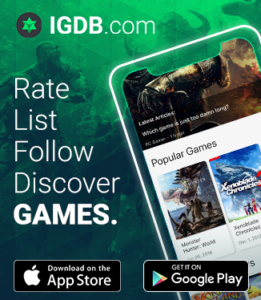 Do you open up the game or not? One school of thought is that you should always remove the plastic shrink-wrap from cardboard boxes. The rationale behind this is that overtime the oils in the plastic degrade leaving a brown residue. I’m sure that anyone with an original Gameboy has seen this over time. Not so much of an issue for the hardware but when it’s plastic shrink-wrap degrading over cardboard there’s a very real chance that the oils can be absorbed in to the cardboard and discolour the otherwise mint collectable. The other school of though is that although still technically a mint edition the factory sealed element is lost upon opening. It’s the dilemma of game and toy collectors everywhere. Until I can finally decide I’ve left mine edition in the plastic but have ensured that there is not currently any degradation and that this one is stored in a cool dry place. Now, the Atari ST version of Disc is easy enough to come by but the Amiga version is much more of a challenge to find in this condition. Although versions have sold for around the £25 mark or $30 in the past there’s a good chance that this game is currently vastly undervalued. The studio that created this game, Loriciel are known to have created some highly collectible games. Don’t be at all surprised to see some of their earlier works pass the $200 mark. Loriciels games in themselves are highly collectable and sought after, particularly in their original French market. I have a suspicion that Disc will be amongst their top collectables in the future. It’s taken some time for me to get hold of my copy. Imagine the search results you get online by just searching the word Disc or Amiga Disc. Anyway, back to the packaging. Its French origins proudly display the French language over the English. Interestingly the headline here is “The first discuss throwing game”. Now, I know what you’re all thinking. Disc was released in 1990. However, it looks somewhat similar to another game “Discs of Tron” released in the arcade back in 1983. Discs of Tron took its lead from the cult movie series. The aim is to stand on one platform and fire discs at your opponents with the aims of knocking them off of their ledge. In truth it looks that Disc did take inspiration from this game but I have to say they vastly widened the scope of play. Again, I know what you’re all thinking. That was 1983, surely that wasn’t the earliest Disc game, what about 1981’s Tron: Deadly Discs for the Intellivision, Atari 2600 and the Mattel Aquarius? First of all, anyone sitting there with a Mattel Aquarius well done, you’ve earned the award of geek of the day. Whilst Tron: Deadly Discs was perhaps the first disc game it’s almost unplayable by today’s standards. 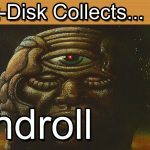 Disc by Loriciel also has no official connection to either of the Tron Disc throwing related games. It’s completely stand alone and almost unique as a concept barring these two Tron games. So, Disc by Loriciel. Is it worth collecting? For an Atari ST version I’d have to say yes, they are reasonably easy to get hold of and won’t cost you too much. The Amiga version on the other hand, this could prove very difficult depending where you’re located. Being in Europe is a little easier for me as I’m a little closer to German and French sellers. It’s still incredibly difficult to find a mint boxed version of this game though. For most the challenge of finding the Amiga version will be the main hurdle. The second will be when two collectors compete in the online auctions. We’ve previously seen Loriciel games go very high in price wars. To get hold of this one you’re going to have to hope you competition haven’t noticed any recent listings. As a backup option you can buy Disc as part of a compilation pack from Loriciel. These also aren’t very easy to find but easier than the standalone version of Disc. In terms of game play I’d most definitely recommend Disc. Admittedly I have an added nostalgia link to this game but even if this is the first time you’ve seen the game I think you’ll be able to get on board and really get in to this one. It’s easy to write this one off if you just casually approach it. It’s once you really scratch beneath the surface a little more, try to drive a game strategy and outfox the computer that you start to see the extent to which the game feels like a real classic. There’s some really great mileage in the replay value of the game design. The tournament mode works well in terms of letting you know how far your skill levels have developed. The challenge mode is also great for a quick round against any of the other opponents. Just for fun you can try to take on the top skilled players. You’ll be slaughtered in seconds as they deliver a real master class of disc combat but you’ll feel satisfied once you develop the skills and reflexes to at least put up a good fight. You’ll start off slowly but end up in some epic matches of speed and skill. Disc isn’t going to be to everyone’s tastes, it’s challenging and somewhat unique. The price may also be a collecting barrier once Loriciel collectors track down the very scarce remaining copies. I’m hoping to put a gaming hidden gem episode together in the future for the channel. You can be assured that Loriciels Disc will feature on a list. In my opinion it’s a title that’s barely known about and under-rated by many that have played it. It’s certainly a fun game once you can journey far enough along the learning curve. The current consensus is that the game had a very low print-run and was confined mostly to Europe. As a result a price for a Commodore Amiga factory sealed edition of DISC is still debated amongst collectors. You can be assured though that it is definitely worth playing and collecting. 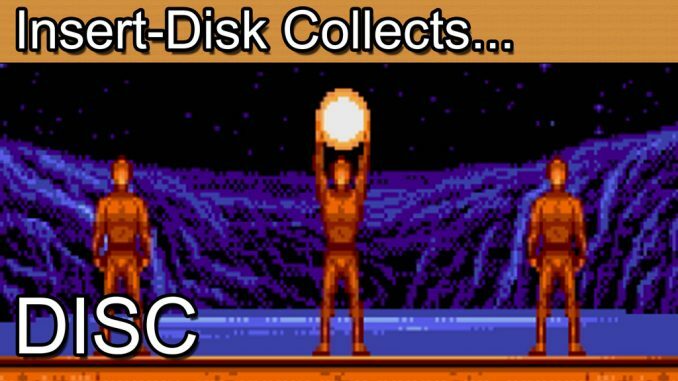 If you like a little sci-fi in your retro sports games then DISC is an ideal choice.